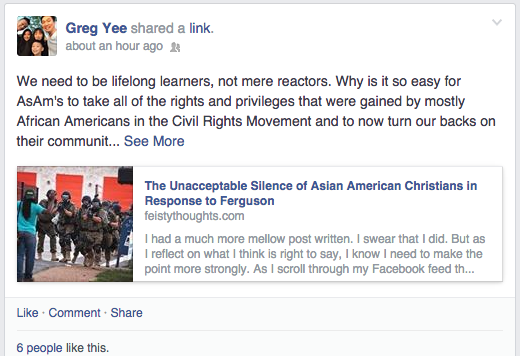 Calling all Asian Americans to speak up about Ferguson? This has been a disturbing week for America in the news as we’ve seen the unfolding events in the wake of Michael Brown’s death. The first post was jarring and convicting. It led me to allude to Michael Brown in my most recent sermon on Politics, although admittedly not by name. But the blog post really stopped me – especially the title. But this time, in a negative way. I’ll be honest, I am pretty new to the public conversation about race. Just check out my previous posts; more people care about my thoughts on being a father of three than on my musings on race and identity. I’m also pretty new to a deeper understanding of the disturbingly unique experience of being Black in America. So rather than keep my thoughts to myself out of fear and shame, I thought I’d put them out there in hopes that the collective wisdom of the internet can teach me something (don’t laugh). As an Asian American, the public conversation about race feels irrelevant to me. There I said it. I’m not saying it is irrelevant, but the dominant language, categories, and history don’t really include people like me. When I think “race conversation”, I think Blacks and Whites. And by most accounts, so do those who write about race in America (or at least those who get posted on Facebook). Don’t get me wrong, I am not insensitive to the pain Blacks feel. Last year, a young black man was shot across the street from our church by a police officer. I went to the vigil, on behalf of our church, to hear their stories and to stand with our neighbors as they grieved without answers; it opened my heart and my eyes. But I also left more convinced that the Black experience in America is unique. Even with the plethora of racism that my family and my kin have faced here in America, it stands in a category that is quite separate from being kidnapped, beaten, trafficked, sold, families rendered, and then systematically discriminated against to boot. Understandably, the Black-White relationship has been the dominant narrative. But that narrative has left me feeling somewhat outside of the conversation. Every time I read Ta-Nehisi Coates, I get it, but at the same time, I don’t get it. Get it? My experience of being Chinese American was less about violence and more about deep psychological insecurity. Just read American Born Chinese. It is the funniest and most sympathetic telling of my racial and ethnic story here in America (is it unacceptable that Blacks have yet to pick this book up in droves?). The short version is that I didn’t grow up fearing White people, I grew up wanting to be like them. Meanwhile, my parents implicitly taught us that we must work hard to be better than them. There were two racial boogie men in our family: the stereotypical dangerous black man, and the stereotypical lazy white teen. We feared the former, but feared becoming the latter. To hear that our “silence” as Asian Americans is “unacceptable” feels not only forced, but makes me feel disrespected as an Asian American. Why is our silence unacceptable? This is probably not the intent of the author, but the impression I get is that, of course we should join in the collective suspicion on White authority. Of course we should stand in solidarity over our collective experience of racism. But see, that is not my story. That is not even the shape of my story. And to suggest that I have any reason to feel the same way that Blacks do when their Trayvon Martins and Michael Browns get shot feels offensive – not just to me, but I can’t imagine how that is not weird to Blacks. 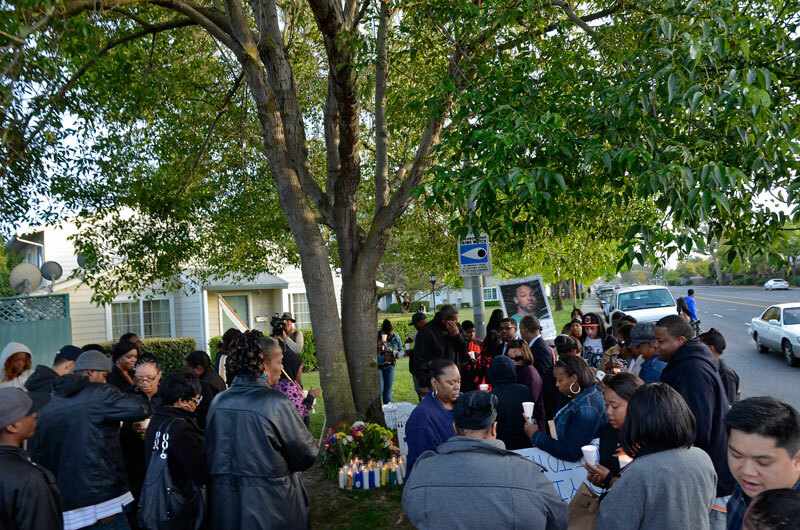 I do not teach my three boys to be suspicious of the police, when we see police officers we stop to ask if they have any stickers for my boys, and I do not see my sons when I see Trayvon or Michael. The relationship that young Black men have with the police or dominant society is categorically different than the relationship that my boys have with them. Now, would I grieve if Michael was my son? Of course. But the rallying cry in the blog is not based on parenthood, but based on being a racial minority. What I appreciate most about my friend Gail’s post is that what moves, angers, and disturbs me about Michael Brown’s death – it doesn’t come primarily from being Asian American (although, I’m sure there is some of that). It comes from the compassion of being a fellow human being who has felt helpless before. It comes from the ability to colorfully imagine Michael Brown being one my son. But most importantly, it comes from being a Christian – who in the pattern of Jesus, is called to not only care about injustice, but to care about the injustices suffered by people who have very little in common with me. Just read the parable of the Good Samaritan. It is a subversive racial story that ends with Jesus telling people like me: Go and do likewise. I am in no way saying that race has nothing to do with Michael Brown’s death. I’m just saying it’s hard for me to see what my race has to do with it. But I’m not so sure how much that really matters in light of the teachings of Jesus. I feel pretty convicted about what’s happening in Ferguson. I guess I could re-post stories and thoughtful commentary. I just haven’t come across too much that doesn’t just feed into the overly simplistic racial picture that we already know exists. Honestly, posting about injustice on Facebook – it’s tired and tiring. Give me a better way, and I’ll do it. These are my honest thoughts. I’d love to hear yours. If you think I’m off-base, let me know. I want to learn.